An Oral B toothbrush testers wanted scam email has been caught by MailShark spam filters claiming you can test and receive the new Oral B Pro for free! We have seen many scam offers like this before and it seems like they may be making a comeback. Oral-B is a brand of oral hygiene products founded in the US but popular worldwide. Be extra careful not to click anywhere within this email as almost all of it will click through to a malicious website. 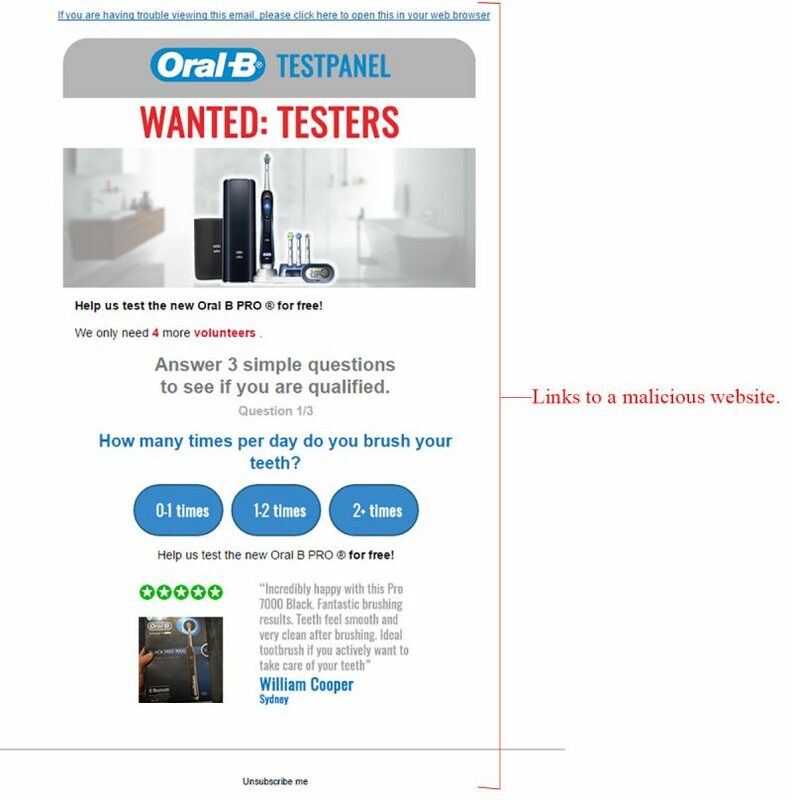 Figure A shows the Oral B toothbrush testers wanted scam email in question. It is well branded and almost anywhere you click will lead you to a website which will attempt to infect your computer with malware. Notice in red the content states they only need 4 more volunteers – this urgency is an attempt to hurry your click. The simple question asked is also a tactic to increase your chances of clicking and the testimonial at the end is used to instil confidence. The subject line reads “try the new Oral B Pro and get it for free!” and the sender is shown as “James Bender” (which could be an attempt at a personalised approach); the email address is clearly spam and in no way associated to the official Oral-B website. Once again, avoid clicking anywhere within this email. Figure B shows the malicious website you will land on if you click anywhere within the email. It is well branded and pushes the product. This page again includes the statement that only 4 packages are available, which is pushing you to answer the question on the right faster. The question asked is in no way relevant to the deal and is basically asking if they can infect your computer with malware, because that is what will happen if you click anywhere on this page. The videos at the bottom, if clicked, will also lead to a malware infection. We strongly suggest you avoid opening this email and delete it from your inbox if received. This test panel email scam features a lot of tricky tactics which could catch you off guard. Keep an eye out for similar emails and remember, if it seems too good to be true it probably is.